Abortion Rights, the UK’s national pro-choice campaign, is hosting an exclusive UK pre-release screening of the ground-breaking US hit comedy Obvious Child! Following the screening, we are excited to chair a panel discussion including the film’s writer and director Gillian Robespierre. Be among the first in the UK to watch this Sundance award-winning film! The film will screen at 7.30pm on Friday 22 August at Genesis Cinema. The panel discussion will finish by 10:30pm. Tickets available here. Tickets are limited for this intimate screening, so don’t miss out! Obvious Child has been critically acclaimed by pro-choice organisations around the world for its realistic and de-stigmatising portrayal of abortion. 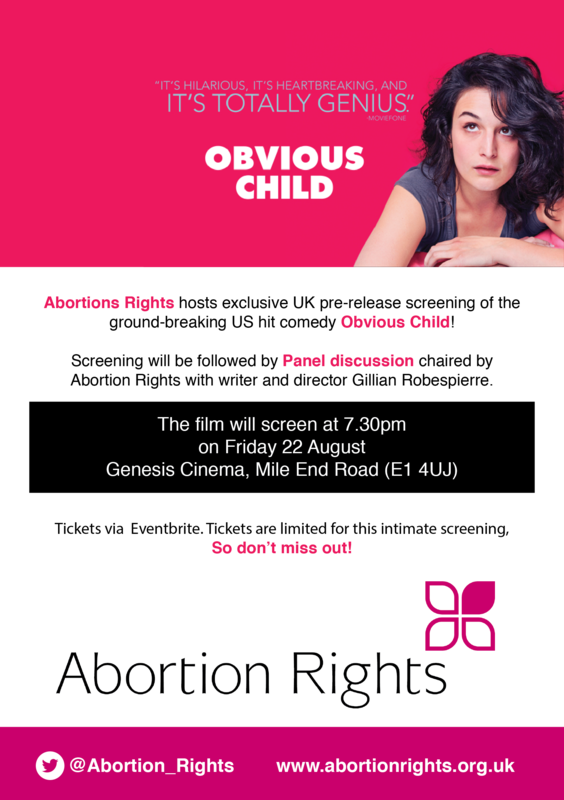 Abortion Rights is honoured to partner with the Obvious Child team to bring this powerful pro-choice message to the UK. You can watch the hilarious trailer here. Please share through your networks! The venue is accessible; please let us know in advance if you have access requirements. If you have any queries about this event please do not hesitate contact us on the phone number/email below.